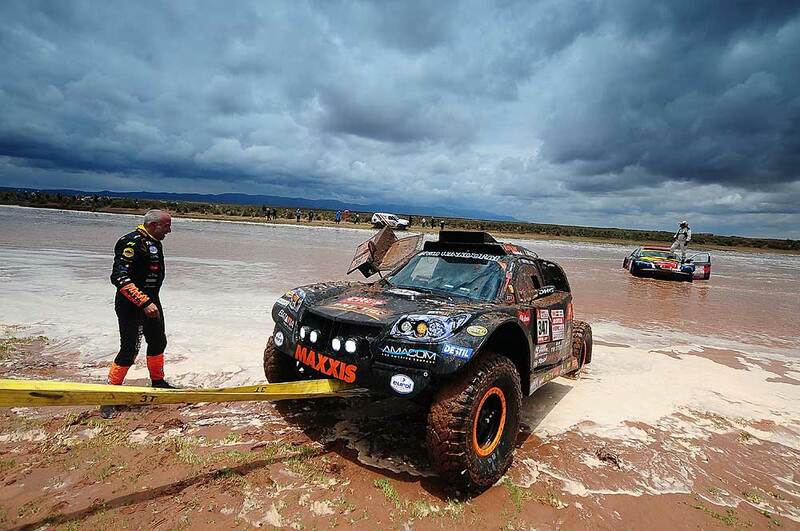 It was by far the longest stage of the 2018 Dakar Rally, but Tim and Tom Coronel posted their best result of this year’s event so far. In the stage that covered almost 500 kilometers, the Jefferies Buggy clearly showed its speed with Tim behind the wheel. The twin brothers continued to post competitive split times on their way to an impressive top 30 result. "A super day," Tim started his report from the bivouac. "At the beginning of the stage, we had a little issue with the rear brakes. The tire deflation system overheated and started melting. Once we saw that the rear tires lost pressure, we quickly stopped, disengaged the hose and we were able to continue. Twice, we stopped to deflate the tires for a dune crossing. We just did it in a clever way. No hurry, we just drove consistently and that brought us our best result so far. It is getting better and better every day, so it is a pity that the stage on Monday has been cancelled. Tom’s navigation was spot-on, so we will really be able to show something nice during the final days." "It simply was really beautiful day," Tom added. "Even though it was a bit thrilling. There is no assistance during such a marathon stage, so we had to ensure nothing broke. Fortunately, things were going really well. I see that Tim is getting to terms with the car better and better. He is driving more and more smoothly. Everything is more automatically, so he becomes more a unity with the car. I am a racing driver myself and I am sitting alongside him, so in fact, I feel the same. That is really great. People ask me every day when I am going to drive, but for me, it is fine like this. Don’t change a winning team. I really don’t mind, I am feeling fine the way it is. Tim is asking me every morning whether I want to drive, but it is okay like this. It is not that I am not willing to take the risk, not at all, but I am simply enjoying watching him drive." Once again, the enthusiasm by the local Dakar fans was enormous. Goose bumps all over for Tom: "We just drove into the village, really unbelievable. No other drivers are getting a reception like that. And I am not saying that to pat myself on the back, because I don’t need that at all. It is fantastic to see how people appreciate the way we are doing what we do. That is the unique emotion of the Dakar rally. Goose bumps all over."